March 14, 2018, Adrian, Michigan – Adrian Dominican Sisters at the Motherhouse campus in Adrian and throughout the United States reached out to their local communities during National Catholic Sisters Week (NCSW), March 8-14, to share their lives and ministries, giving people a glimpse of what their vocation means to them. 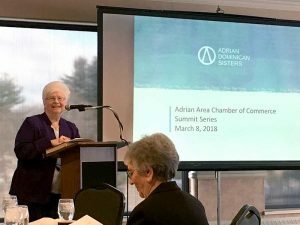 Sister Patricia Siemen, OP, Prioress of the Adrian Dominican Congregation, offers a presentation on the Congregation’s history and spirituality during a breakfast at the Adrian Area Chamber of Commerce. In the foreground is Sister Patricia Harvat, OP, General Councilor. Begun in 2014 as part of National Women’s History Month, NCSW was founded by the National Catholic Sisters Project to shine a spotlight on Catholic Sisters in the U.S.
Members of the General Council – Sister Patricia Siemen, OP, Prioress; Sister Mary Margaret Pachucki, OP, Vicaress; Sister Frances Nadolny, OP, Administrator; and Sisters Patricia Harvat, OP, and Elise D. García, OP, General Councilors – gave a presentation on the Congregation’s history, background, ministries, and Enactments to the Adrian Area Chamber of Commerce on March 7. 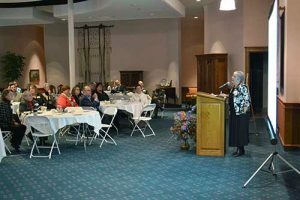 The presentation was repeated March 8 at a special breakfast at the Motherhouse prepared for local community and non-profit leaders. “We really delight in the opportunity to share with you a glimpse of our life and what happens on this side of the campus,” Sister Patricia Siemen said, noting that many of the guests were familiar with life on the other side of campus – Siena Heights University. Sister Patricia Harvat, OP, addresses guests at the Adrian Dominican Sisters’ National Catholic Sisters Week breakfast. Sister Pat situated the Adrian Dominican Sisters among the 47,000 Catholic Sisters; the 300 Congregations of Catholic Sisters, the 4,000 Dominican Sisters, and the 19 Congregations of active Dominican Sisters across the United States. Sister Pat also spoke of the history and spirituality of the Dominican Order and of the Adrian Dominican Sisters. In addition, the other members of the General Council each spoke on one of the 2016 Enactments, focuses that the Congregation chose for the next six years after General Chapter 2016. In each description of the Enactments – Spiritual Longings, Sustainability, Resilient Communities, and Diversity – the General Councilors invited members of the local community to participate and to collaborate with the Sisters. Also on March 8, about 16 Sisters and Co-workers from the Motherhouse spent part of the day with members of the Hope Community Center, an organization for developmentally disabled adults. The Sisters and Co-workers presented the members with cards created by retied Sisters and spent time talking to the members and leading activities such as basketball, games, coloring, and karaoke. Hope Community Center is also the recipient for the six months of 2018 of funds raised through ADS Gives, a Co-worker initiated charitable fund. Other Sisters living and ministering in Adrian spoke at 10 different service club meetings between March 6 and 14. Sister Virginia Corley, OP, left, shares a light moment with Kate Hamilton, Director of Alumni Relations for Siena Heights University, during the lunchtime “Speed Date a Sister” event on March 13. Sister Mary Jones, OP, Director of Mission Education and Heritage Development at Siena Heights University in Adrian, organized the annual “speed date a Sister” event. 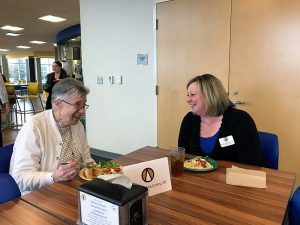 During lunch on March 13, students, faculty, and staff members of Siena Heights spent time with a few of the dozen Adrian Dominican Sisters who came to the University. The event gives members of the Siena Heights community the opportunity to learn more about the lives of the Sisters. Sisters throughout the United States also reached out to their communities during the week. National Catholic Sisters Week came early to Plantation, Florida, where, on February 27, Sister Joan Leo Kehn, OP, and St. Gregory the Great School hosted 900 sixth-grade students from Catholic schools in the Archdiocese of Miami. The day of retreat introduced the students to possible Church vocations, including religious life and the priesthood. 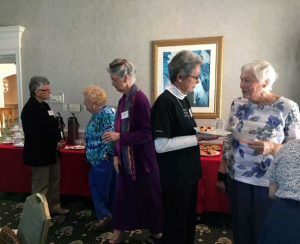 Sisters Donna Baker, OP, left, and Mary Ann Caulfield, OP, second from right, speak with other Sisters serving in the Diocese of Palm Beach during a special afternoon of reflection sponsored by the diocese. Women and men religious of the Diocese of Palm Beach, Florida, gathered on March 4 for an afternoon reflection by Father John D’Mello on Pope Francis’ January 2017 message, Nonviolence: A Style of Politics for Peace. Aquinas Literacy Center in Chicago – one of seven literacy centers sponsored by the Adrian Dominican Sisters – hosted a special “Dine and Discuss” evening on March 14. The evening included dinner, followed by a presentation on “The History and Impact of the Adrian Dominican Sisters in the McKinley Park Community.” Sisters Claudia Hinds, OP, and Rosemary Brennan, OP, opened Aquinas Literacy Center in the basement of the convent at Our Lady of Good Counsel Church in 1996. Adrian Dominican Sisters still serve on the Board and as tutors. Adrian Dominican Sisters also hosted special NCSW events for their parishes and other communities. Sister Carol Johannes, OP, for example, facilitated a reflection on the great Dominican mystic, St. Catherine of Siena, for a women’s spirituality group at St. Mary’s Student Parish in Ann Arbor, Michigan.